Magnetic Numbers this number and maths set comes in a wooden box with a perspex lid. The set contains 41 pieces comprising of 3 zeros, 11 ones, and 2 of every other number to nine. 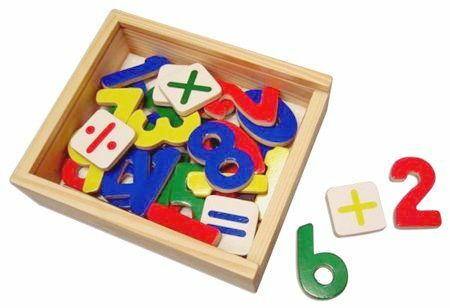 The set also contains five, square, magnetic, mathematical symbols, addition, subtraction, division, multiplication and equals. The numbers are brightly coloured and magnetic so they can used on the fridge or any metal surface. A great learning tool and a wonderful way to introduce numbers and maths. Size: 5cm by 4cm The Box is 17cm by 15cm by 5cm. We like this because: "Great way to start learning numbers and they are lovely colours."